The positive impact of dividends can be seen not just in the US, but all over the world. And it’s even more impressive over time. Since 1930, dividends have made up roughly 40% of the total return of the S&P 500 Index. Plus, dividend-paying stocks have compounded total returns of 9.2% vs. 2.3% a year for non-dividend-paying stocks. 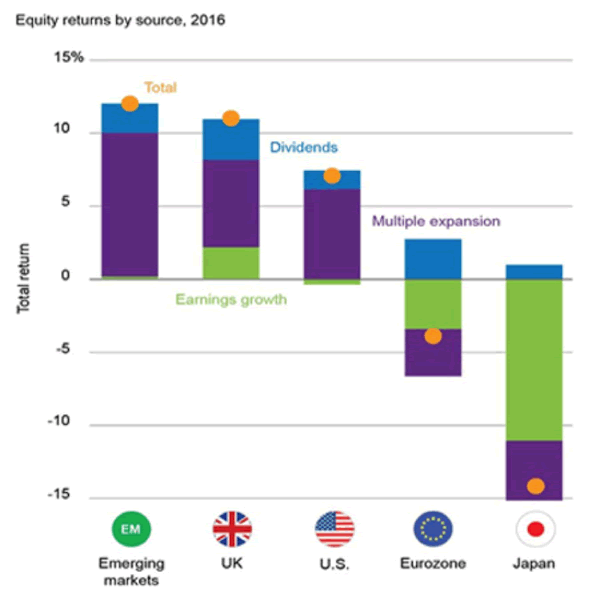 The sweetest spot of the dividend-loving world is companies that can routinely increase their dividend. Here’s what I mean: If you invested $10,000 in a company that pays a 3% dividend, you’ll receive $300 in dividends a year. But, what if that company increases its dividend by 5% a year? After 10 years, you’ll have $3,773 in dividends and enjoy a yield of 4.65%. These 10 S&P 500 stocks have raised their dividends the most over the last three years: SunTrust Banks (STI), Citigroup (C), Bank of America (BAC), Zions Bancorp (ZION), Regions Financial Corp. (RF), MasterCard (MA), Danaher (DHR), Southwest Airlines (LUV), Capital One (COF), and Vulcan Materials (VMC). Of course, dividends are not a sure thing. They can be reduced or removed at any time a board of directors sees fit. But this select group of companies has increased dividend payments for 25+ consecutive years in a row. 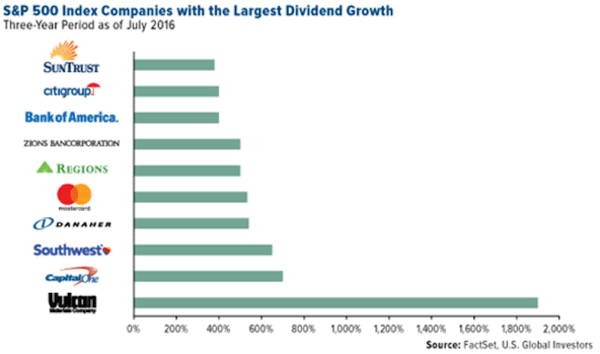 The media calls these companies “Dividend Aristocrats,” and they are a great starting point for all dividend hunters. If you’re more of an ETF investor, there’s a trio of ETFs that are tailored toward dividends. SPDR S&P Dividend ETF (SDY) is one of the most popular dividend-focused ETFs. It is made up of companies that have been consistently increasing their dividends every year for at least 25 years, such as the Dividend Aristocrats. Vanguard Dividend Appreciation ETF (VIG) invests in the NASDAQ US Dividend Achievers Select Index (companies that have increased dividends over the past 10 years). SPDR S&P Global Dividend ETF (WDIV) takes a global approach to dividends, with companies that have raised dividends for at least 10 consecutive years. Dividends may seem boring if you’re looking for casino-like thrills. But, the path to long-term wealth is slow and steady.